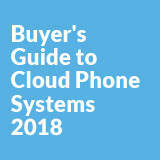 It’s important to understand your options, your current business needs and future requirements before making a purchasing decision for a business phone system in the cloud. Onsite phone systems are expensive to maintain and their restrictions may not fit with your business needs. If you are looking to move your telephony to the cloud, it is crucial to map business and functional requirements to the solutions available. With the right business phone system, companies can save time and money. A telephony platform should come with a wide range of features as standard, but buyers should be wary of hidden costs for additional features from some providers. The system should be scalable and able to integrate with other systems and applications in your company, such as CRM. Moving to the cloud should not only be a financial no brainer but also deliver better technology to your users driving greater efficiencies in your workforce. The aim of this buyer’s guide is to provide essential information and useful tips to consider before making your decision. It has become important to understand how customers wish to engage with and interact with a business so that the most appropriate omnichannel strategy can be devised and implemented.